Being a CTS athlete, I regularly receive in my e-mail articles written by CTS Coaches of articles related to the Sports of Ultrarunning and other Endurance Sports. The following article is very timely for those athletes and runners who will joining ultra marathon events in the months of July up to the later part of October in the United States as most of these events happen during extreme heat temperatures.Personally, this had been my problem through the years on why I failed to finish 100-mile trail races in California, Utah and Nevada in the past years. 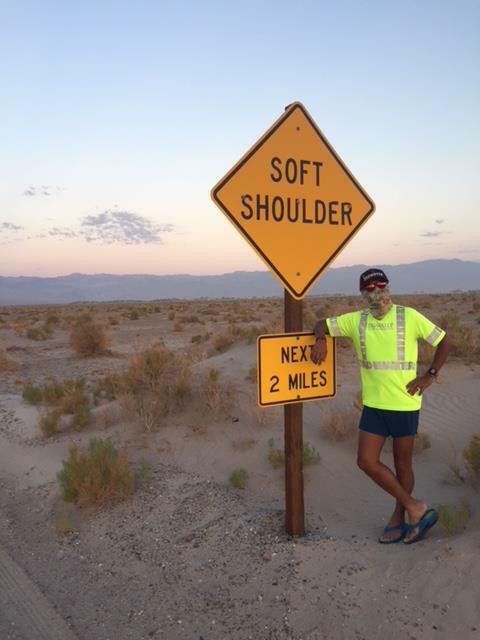 However, with my Support Crew and Pacing experience in last month’s Badwater 135-Mile Ultramarathon, I was able to solve my problem on my hydration and heat prevention. Through the help of my CTS Coach John Fitzgerald, I was able to correct my electrolyte imbalance whenever I run in an environment that is too hot during my training in my Playground in the Philippines. For the past three months, I had been weighing my body before and after my runs in order to determine my body sweat loss within a period of time of running. As a result, I would determine how much liters of water and electrolytes I would carry depending on how many hours I would be out for my run, whether in the early morning or late in the afternoon. As I continue to write and post my 2018 Badwater 135-Mile Ultramarathon, I will mention something on the later part of my blog on how I was able to manage the extreme heat during the time that I paced Tess Leono for almost 32 miles (50 kilometers) under the heat of the sun. Without much further ado, I am now reposting this article and I hope that those who are planning to do ultramarathon races in hot environment will learn a lot and be able to apply the preventive measures stated in this article. Let this be a reference to all ultra runners out there. Human beings are inherently inefficient. Only a fraction of the work athletes do ends up propelling them down the road, up the mountain or through the water. The rest just of that work generates heat, which has to go somewhere. Normally, the body is reasonably good at dissipating heat, until the environment is also hot and/or humid. Heat illnesses develop when you can’t adequately dissipate heat to the environment, and involves an incredibly complex relationship between your thermal physiology (all that heat you are producing), environmental heat strain, and your clothing (2). Many experienced endurance athletes are well versed in hydration and cooling strategies, but as a community it is crucial for all athletes to understand the signs and symptoms of heat illness, how to prevent it, and how to help athletes suffering from it. Heat illness doesn’t care how much you know about hydration and cooling. Despite all the right preparations, even experts and experienced athletes can end up with heat illness when things go wrong during training or competition. There are two main types of heat illness: classic and exertional. Classic heat illness is directly related to the environment and how the environment is effecting one’s ability to dissipate heat. These factors include high temperature and humidity, strong direct sun exposure, and still air. Exertional heat illness on the other hand is primarily caused by your own heat production, which is why exertional heat illness can occur in all types of weather (3). It should be noted that the treatment and identification does not change between classic and exertional heat illness, but illustrates the fact athletes should be aware of the signs of heat illness even in cooler and less humid environments. UNDERSTANDING YOUR ENVIRONMENTAL RISK BEFORE A RUN, RIDE, OR RACE CAN BE CRITICAL FOR SUCCESS AND YOUR HEALTH (4). Although 98.6 F (37 C) is generally accepted norm for human body temperature, it is normal for core temperature to fluctuate within a small range of 97-99 F (36.1-37.2 C). When your body increases much above or below this “set” temperature you can experience hyperthermia or hypothermia as your body tries valiantly to bring your body back to homeostasis. When you get too hot your one of the best way your body can cool itself down is to shift more blood flow to the capillaries that lie immediately underneath your skin. What this allows your body to offload some of the heat into the environment and in turn send cooled blood back deep into your body. The second way your body combats the likely rise in core body temperature is by increasing your sweat rate. This allows you to utilize evaporative cooling, which cools the body by creating a temperature gradient as sweat (or other water) evaporates from your skin surface into the air. The neat thing about the increase in your sweat rate per hour during the heat is that your sweat becomes more dilute than usual which makes it even easier for your sweat to evaporate from your skin into the air. Additionally, there are three environmental mechanisms that can both prevent your core body temperature from increasing and also increase your core body temperature. Those mechanisms are radiation, convection, and conduction. All three rely on temperature gradients where the heat goes from the warmer environment to the cooler environment. In an ideal world that means your body is the hot environment and you are able to dissipate heat into the surrounding environment (5). While you exercise and race your body relies on these thermoregulatory adjustments because during exercise you produce 15-20 times more heat than you do at rest. Without these crucial adjustments, either physiological, environmental, or behavioral changes, your core body temperature will rise 1.8 F (1C) for every 5 minutes of exercise (3). Heat-related illnesses start out mildly uncomfortable and progress all the way to life threatening. The conditions are, from least serious to most serious: heat edema, heat rash, heat syncope, heat cramps, heat exhaustion, and heat stroke (3,4). Heat edema and heat rash are both the mildest forms of heat illness you might experience. Heat edema can occur as your body tries to dissipate heat by vasodilation and a shift of blood flow to your skin. This most commonly happens in the lower extremities as fluid creates inflammation in your feet and ankles. Heat rash (also called prickly heat or miliaria rubra) is a pinpoint red rash that forms on the skin that was covered by clothing. This generally happens in areas that have a higher concentration of heat glands, like your trunk and groin, and is caused by the increase in sweat saturating the clothing and your skin surface clogging sweat ducts. Heat syncope, or fainting caused by heat, may happen during heat exposure because blood is being shunted to your skin and extremities. Rapid changes in body position (commonly sitting to standing, or bending over and standing back up) can lead to a temporary change in blood pressure that causes a person to faint. Most athletes recover quickly once laid flat, which allows blood flow to normalize. That being said, falling due to a rapid loss of consciousness could lead to a concussion, and an athlete who faints due to heat should be evaluated before being allowed to continue training or competing. Heat cramps or muscle spasms have been notoriously linked with dehydration and electrolyte imbalances over the year. However, we now know exercise associated muscle cramps are more commonly associated with a wider range of variables such as fatigue and muscular imbalances. Although harmful to performance, exercise associated muscle cramps are generally harmless to your health and most commonly occur on one side of your body (i.e. your left quad or your right calf). If you are experiencing bilateral, or both sides, cramping or full body cramping, this is often linked to a more serious condition such as extreme dehydration or hyponatremia (depleted electrolytes from excessive water consumption) and should be immediately addressed by your physician or the medical team at your event. As we move up the scale in severity we come to heat exhaustion. Heat exhaustion should be taken seriously and treated quickly, as it can advance to more serious and potentially life-threatening conditions like heat stroke. Heat exhaustion generally presents with fatigue, dizziness, heavy sweating, nausea, vomiting, headache, fainting, weakness, and cold clammy skin. A person with exhaustion typically still has normal cognitive and neurological function. They should be able to answer questions about their condition, where they are, who they are, etc. Heat stroke is characterized by a core body temperature greater than 104 F and altered central nervous system function, including irritability, confusion, combativeness, or even worse, loss of consciousness. Hot and dry skin is a sign of heat stroke, but it is important to realize a person can be sweating and still have heat stroke. Altered central nervous system function is the hallmark difference between heat exhaustion and heat stroke, but when in doubt, treat the situation as if the athlete has heat stroke. Athletes showing signs of heat stroke need to be treated by medical professionals as soon as possible. It should be stressed that heat stroke is incredibly serious and can lead to death if not treated quickly. THE CONTINUUM OF HEAT ILLNESS (3). The most recent estimate is that heat related illnesses cause 695 deaths per year in the United States, but they are the 3rd highest cause of death amongst athletes. There are two main categories of risk factors: environmental (external) factors and physiological (internal) factors. Environmental factors include how hard you are working, clothing choices, insufficient shade during activity, lack of access to water, ambient air temperature, and humidity. Internal factors include age (people under the age of 15 or over the age of 65 are more susceptible to heat illness), recent alcohol consumption, acute or chronic dehydration, history of heat-related illness, medication or supplement interactions, recent illness that included a fever, recent head injury, sunburn, skin conditions (eczema or psoriasis), or insufficient heat acclimation (3). As with many medical emergencies, time is an extremely important factor in treatment of heat-related illnesses. The goal is to get core body temperature down to an acceptable level (below 38C or 100.4 F) as quickly as possible. It’s important to note that although fevers generally present at similar temperatures to what we call hyperthermia (temperatures above 100.9 F) the underlying mechanism is different. In general, our thermal max is a narrow range from 106.8 -107.6 F. Sustained core temperature at this level for anywhere from 45 minutes to 8 hours can be lethal, and one of the factors for predicting the outcome for a person with heat stroke is how long they are hyperthermic. Body temperature of 106.8 – 107.6 F may seem awfully high, but when you are exerting yourself in hot conditions, it is not uncommon for body temperature to reach 102-103 F for short periods of time. Adverse conditions, either internal or external, can cause core body temperature to stay elevated or rise to higher, more dangerous, levels. The key takeaway from research institutes, such as the Korey Stringer Institute, that focus on heat-related illnesses is to cool the athlete down as quickly as possible to protect the athlete’s brain and vital organs. To do that, the critical first step is to recognize you or another athlete is in trouble. This step is often missed, which allows heat illness to progress to dangerous levels. Get out of direct sunlight and into a shaded, cooler environment. Finally, use whatever you have to cool off. This can include dousing with cold water from a hose or shower, wrapping in cold towels, applying ice packs or immersion in an ice bath, and having them ingest cold fluids. Athletes experiencing heat stroke need medical care immediately, with the goal of lowering body temperature to below 104 F within 30 minutes. The best ways for athletes to avoid heat-related illness are to heat acclimatize before training hard or racing in a hot environment, monitor and manage your hydration needs, and utilize cooling techniques to help manage your core body temperature. Doing these three things well will reduce the physiological strain of training and racing in the heat and optimize performance. The most important of these three is heat acclimatization because it not only improves thermal comfort, or your psychological tolerance to the heat, but also it improves your physiological thermal tolerance, which is your body’s ability to tolerate heat exposure for an extended period of time. The physiological benefits of heat acclimatization include increased skin blood flow and increased sweat rate, both of which help to dissipate heat quickly and efficiently. During heat acclimation you also have an increase in your blood plasma volume, which allows you to better sustain your blood pressure and work capacity (1). These adaptations take roughly 7-14 days to fully manifest. Because of this, it is important to monitor your level of exertion as your body makes these adaptations. During this time you will naturally have a change in threshold pace, power output, and both maximal and submaximal heart rate. Don’t force it. Dehydration is one of the key precursors to developing a heat-related illness. Although dehydration generally occurs from an inadequate intake of fluids, it can be made worse by an excessive amount of fluid loss through sweating, putting you in a state of hypohydration (Howe et al). Regardless of whether you’re putting too little in the tank or losing to much from sweating, from an athletic standpoint it has been shown that your heart rate will rise 3-5 beats/min for every 1% of bodyweight loss due to dehydration (Coris et al). When dehydration occurs your blood plasma volume shrinks, which not only effects your heart’s ability to do its job, but also decreases blood flow to the skin and sweat rate. As a result, performance declines and the chances of developing heat illness increase. What this means is that you should monitor not only your during-activity hydration but also your pre-exercise and post-exercise hydration when temperatures begin to rise. It is recommended that you start your exercise or race euhydrated, which just means starting at a normal level of hydration and not getting to the start line dehydrated or hyperhydrated. Adjusting your day-to-day hydration status takes some time, and guzzling fluid isn’t helpful. Rather, try the WUT method and make appropriate adjustments to daily fluid intake. When it comes to hydration during exercise the idea is to minimize losses in total body water mass. During strenuous exercise in the heat, sweat rates can reach 1.5 liters per hour, and sometimes higher. General recommendations are to consume 16 – 24 ounces of fluid an hour, but endurance athletes in hot environments often need to consume 2-3 times that much. You can figure out your approximate sweat rate by weighing yourself pre- and post-workout. When it comes to post race or activity hydration the old staple was to try and replace 150% of body mass losses during the first hour of your exercise stopping (6). For many athletes this simply wasn’t practical and caused some GI discomfort, and because of this the most realistic guideline is to try and replace 100-120% of body mass lost in the first hour after you stop exercising (1) and continue consuming fluids in the hours after that. CTS has long recommended athletes aim to consume 150% of fluid losses within 4 hours after exercise. The final components to avoiding heat-related illnesses are the little things you can do to work with your environment and not set yourself up for failure. You can choose to wear light colored and loose fitting clothes. Additionally, you can utilize two different methods of managing heat exposure by either continuous cooling methods or pre-cooling techniques. Continuous cooling methods utilize both external and internal cooling methods. Some external cooling methods include the application of iced/cooled down clothing, towels, water immersion or dousing, or packing ice onto athlete via ice bandanas, ice socks, or into clothing and hydration vests. Internal cooling methods generally rely on the ingestion of cold fluids or ice slurries to try to maintain a lower core body temperature. When it comes to endurance activity in particular, pre-cooling methods have been shown to be effective in both improving performance and delaying the inevitable rise in the core body temperature. What this means is that an athlete getting ready to compete in a warm environment can benefit from starting their event with a lower core body temperature. This can be accomplished by ingesting cold ice slurries, or now the use of a commercial ice vest (or more simply cold iced down towels around your trunk and shoulders) during your warmup. It’s been shown that these crucial minutes of cooling down before you hit the start line or the start button on your watch can prolong your body’s ability to maintain a lower core body temperature (1). When it comes to exercising and racing in the heat, prepare yourself for the demands of the environment, manage your fluids, and utilize physical methods of cooling yourself off. Taking a moment to cool off now might slow you down temporarily but cannot only save your race or workout in the long run, but also your life.